The global food and beverages processing equipment market was worth around US$ 55.9 Billion in 2018. Food and beverage processing equipment use physical and chemical means to transform raw ingredients into prepared food and are used in the production of dairy, bakery, poultry, seafood, beverage and confectionery products. In addition to this, they are employed to monitor processes in packaging and labeling applications and quality management. Apart from this, processing equipment are also being used to automate various processes in the food and beverage industry, such as heating, blanching, cooking, and pasteurization, to decrease the overall production time and increase the efficiency. In recent years, the strict regulations and guidelines governing the food and beverage industry have increased the demand for high-quality processing equipment worldwide. The arrival of green technologies has encouraged the manufacturers to replace their old food and beverage processing equipment with energy-efficient variants that help in minimizing the overall cost of production and reducing their carbon footprint. The manufacturers are also introducing advanced technologies to improve the existing processing equipment. For instance, they are incorporating machine learning and Industrial Internet of Things (IIoT) as well as offering flexible and customizable equipment. Some of the other factors driving the growth of the global food and beverage processing equipment market include altering dietary preferences, rising number of quick-service restaurants (QSRs), and growing demand for healthy, nutritious and ready-to-eat food products. 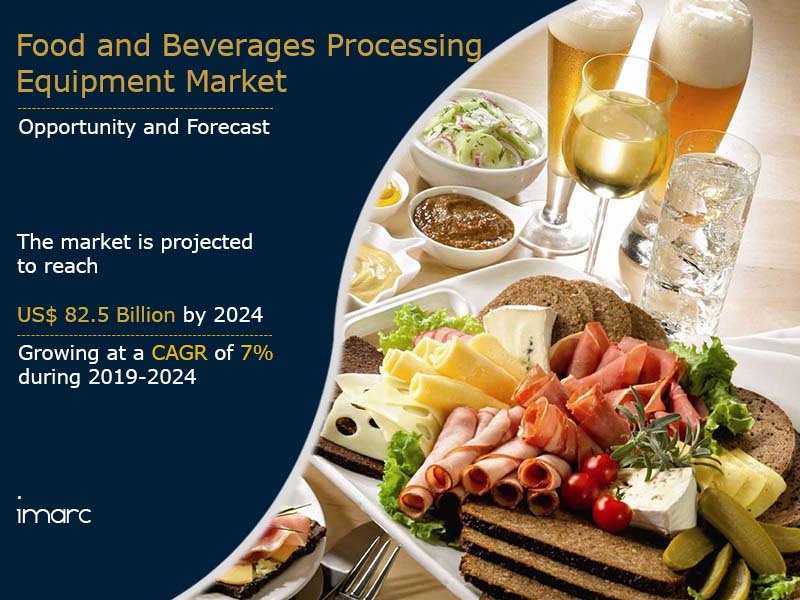 Looking forward, we expect the global food and beverage processing equipment market to grow at a CAGR of around 7% during 2019-2024, exceeding a value of US$ 82.5 Billion by 2024. Based on the type, the market has been segmented as pre-processing and processing equipment. Based on the end-product form, the market has been segmented as solid, liquid and semi-solid. Based on the mode of operation, the market has been segmented as semi-automatic and automatic. Based on the application, the market has been segmented as bakery and confectionery products, meat and poultry, dairy products, fish and seafood, alcoholic beverages, non-alcoholic beverages and others. The competitive landscape of the market has been examined with some of the key players being Marel, GEA Group, Bühler, JBT Corporation, Alfa Laval, TNA Australia Solutions, Bucher Industries, Equipamientos Cárnicos, S.L. (Mainca), Clextral, SPX Flow, Bigtem Makine, Fenco Food Machinery and Krones Group.